Explore New Zealand with a flexible 'Book As You Go' bus, scenic coach and ferry pass that allows you to travel on New Zealand largest national bus, coach, ferry scenic travel network in association with InterCity Coachlines, Newmans Coachlines and Great Sights with sightseeing tour services. All 'Flexi' bus, coach and ferry passes have been designed for the independent traveller, families or small groups, who want to get the best out of their New Zealand holiday and experience New Zealand's scenic beauty plus having the benefits of affordable travel. Travel is on modern eco-friendly buses and coaches with friendly drivers. Some bus and coach services have onboard washroom/ toilet facility and reclining seats with foot and head rests. All 'Flexi' bus, coach and ferry passes, allow you to travel between the North and South Islands with ease as your pass includes travel on Cook Strait ferry services between Wellington and Picton. 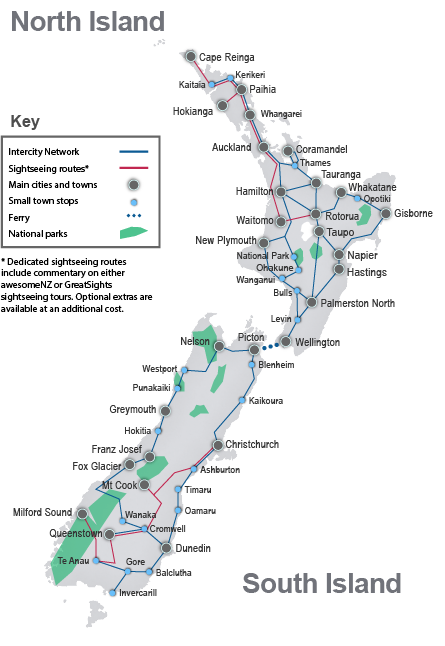 To help you to plan your bus pass travel, there are a range of suggest travel itineraries, that will give you an unique experience of New Zealand's scenic regions from the varied farming lands, the volcanic plateau and river gorges of the North Island, the beautiful Marlborough Sounds whilst on a Cook Strait ferry travelling between the North and South Islands, the wine growing regions of Marlborough, the rugged coast line for the Kaikoura coast, the alpine scenery of the Southern Alps of the South Island to the skifields of the North and South Islands. All 'Flexi' bus, coach and ferry passes have a travel planner so you can plan your travel requirements or just go when you want too. You can also make online accommodation and sightseeing tour reservations of the various stopover destinations contained in each travel itinerary. All suggested travel itineraries have been design to meet the validity requirements of your 'Flexi' bus, coach and ferry pass. Alternatively, you can have one of our knowledgeable friendly travel consultant's plan your New Zealand holiday, by contacting our Travel Centre team by phone, web chat or Skype call or chat.